* The advertised Lease is a rental-purchase agreement for new merchandise. Unless you exercise your Early Purchase Option, to acquire the merchandise you must make 52 weekly payments of $12.00 (plus tax & delivery), for a $624.00 (plus tax & delivery) Total Cost/Total of Payments. This includes a $305.59 Cash Price3 and a $318.41 Cost of Rental. 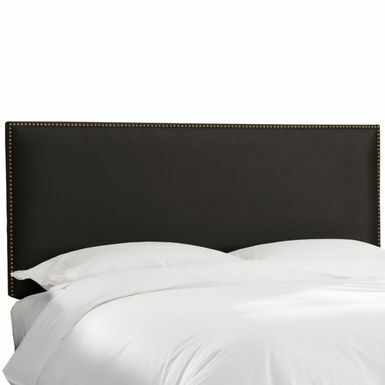 Add modern sleekness to the bedroom with this black microsuede headboard. 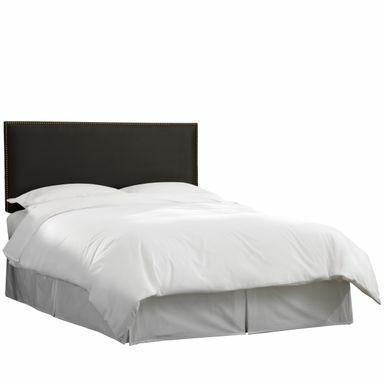 This headboard is upholstered with polyester micro-suede and filled with polyurethane foam. It has brass-toned nail buttons that give an air of modern elegance. Give your bedroom an update to complete your decor. This headboard features a solid wood frame with foam padding and is fully upholstered in an black color polyester fabric.